Hello, everyone! I'm so excited to announce that I'm going to be joining the Jerry's family as an Art Ambassador. This means I'm going to be getting cool new products to try out with you! I've always loved sharing my process, and I'm thrilled to get the chance to try out some new supplies. One of my video tutorials this month will be going over how to paint a seascape. I'm going to be posting the full 20 minute long tutorial for the Starlight Tier later this evening, but for now I thought I would show you the preview! Thank you Lisa for suggesting an ocean waves tutorial. I have listed my materials below, including some of the new paints and brushes that Jerry's sent over my way! ﻿At the $25 level you get everything included in the first five levels of patronage (monthly Coloring Pages, tutorials, behind the scenes, access to the secret store. ), PERMANENT 20% OFF GalleryGerard.com discount, and a membership to the Gallery Gerard PIN COLLECTOR reward! 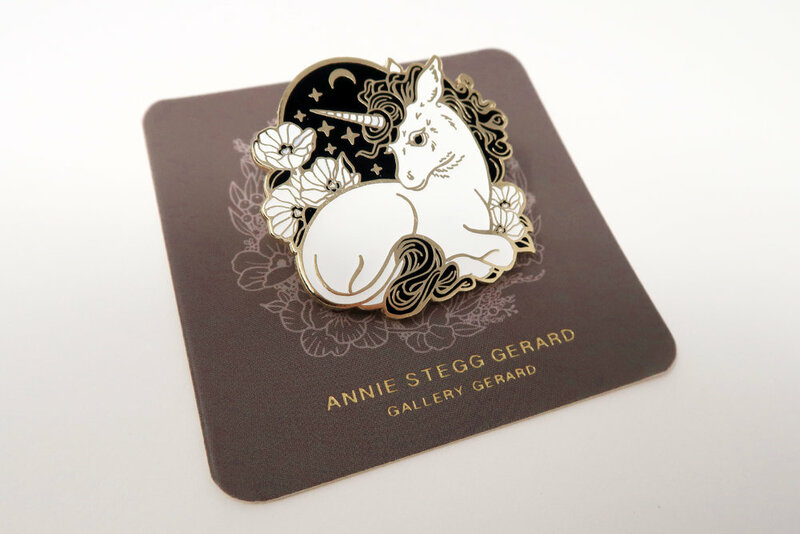 For the first month, sign ups will immediately receive the patreon exclusive pin "Wish" (the unicorn) pin as well as the new pin of the month. Each month you will receive the current Pin of the Month automatically. I have some really cute ones coming up! Plus, if I release any other Patreon exclusive pins, you will receive those as well. Shipping anywhere in the world is included in this tier. Remember, new signs ups get the patreon exclusive unicorn pin, “Wish” sent to them automatically, along with the pin of the month! This month, new pin club sign ups get 2 pins and one sticker for $25 shipped anywhere in the world! At the $25 level you get everything included in the first five levels of patronage (monthly Coloring Pages, tutorials, behind the scenes, access to the secret store. ), PERMANENT 20% OFF GalleryGerard.com discount, and a membership to the Gallery Gerard PIN COLLECTOR reward! 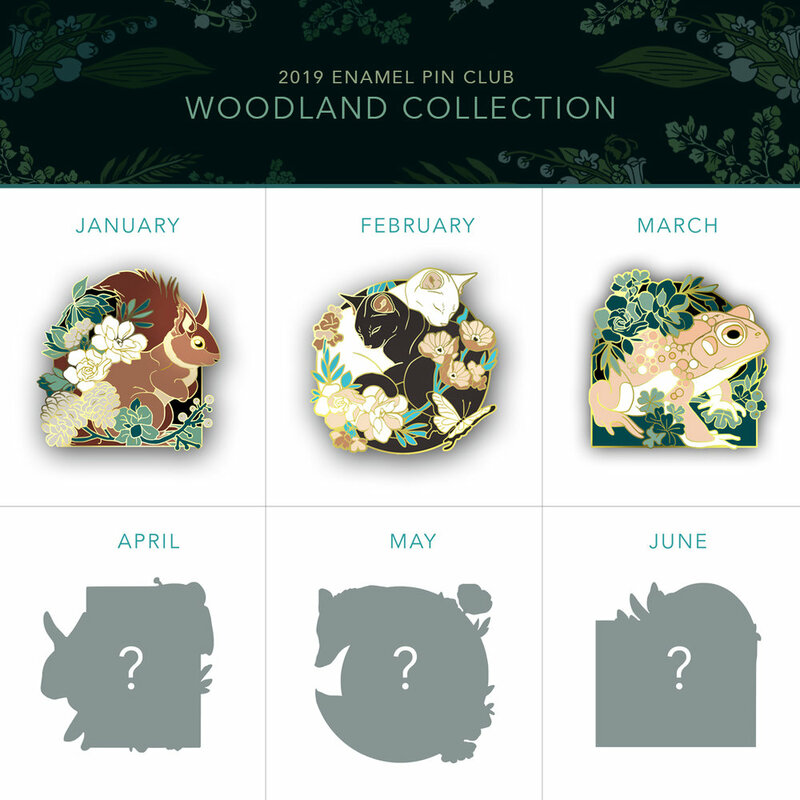 This month, new pin club sign ups get 3 pins for $25 shipped anywhere in the world! It has taken us a while, but both our Patreons are now up and running! On our Patreons we are sharing sneak previews, video tutorials, High resolution versions of our work, Photoshop Brush sets and a lot of other surprises. We will still be posting our work here and on social media as always, but Patreon subs will see everything sooner, in better resolution, and with more in-depth tutorials and guides. It is also a great way to support us if you like what we are doing! See the painted works of "The Moonlit Vale" in person this Saturday! The series will include 8 original paintings that will be displayed and available for purchase at Gallery Nucleus. We will also feature a giant coloring page for attendees to enjoy. An opening reception will be held on Saturday, June 16, 2018 from 6 – 9pm. *Books purchased on opening night will include a special book plate of "The Mermaid"
JUSTIN GERARD SKETCHBOOK 2017 PRE-ORDERS ARE LIVE! The Sketchbook will feature 42 full color pages with drawings, sketches, preliminary work, as well as selected finished work from the year. Each copy is signed and numbered. And as with previous years we are offering a Limited Edition version with an original drawing in the front and a mini-print of "Let the Wizard Do the Talking". The book is scheduled to be released June 14, 2018 but everyone who pre-orders before June 14 will receive a free signed mini-print of "Mean Tweets." The artwork is professionally printed on a heavy stock semi-gloss paper and comes packaged in a re-sealable clear plastic sleeve. It is shipped in a cardboard photo mailer with a backing board for added durability. The image is signed by Justin Gerard. Our second monthly coloring contest has come to an end! Once again we received so many beautiful entries. Thank you to all the participants and to our wonderful judge, Nikki Hodges. We loved looking through all of your lovely owls! It's the Month of Love! Did you know that the barn owl is a solitary creature until it pairs with its mate? Once they find one another, they will remain together for the rest of their lives. This month let's celebrate these feathery companions with a coloring contest! Today, I am wading back into the Silmarillion to bring you widespread panic, epic conflict, devastation on a cosmic scale, and hopefully some interesting Photoshop tips. The scene I am working on for this two-part series is of Melkor (now named Morgoth by a furiously angry Feanor) and the taking of the Silmarils. This is a global catastrophe for pretty much everybody in Middle Earth, except perhaps for Balrog real-estate agents. And we see all of this against the backdrop of the specific anguish of Beren, who has returned to see his homeland of Doriath burned in the battle of Sudden Flame. The goal of this composition is to collapse both these small and large concepts into a single image. I always start these images as scrappy little ink drawings, which I have enlarged here, but really, they are just scraps of barely legible lines. From these I pick the one that strikes me the most and wrestle it into a photoshop file. Quick tip: When making your early conceptual file, it helps to know what size you want it to eventually be. Going for a 16x20 painting? Go ahead and drop this composition into a file size of that dimension. It will save you headaches later. Now that I know generally what my composition will be, I do some exploring. First, a quick monochrome pass in Photoshop to clean up and enhance my scrappy little ink drawing. This is very important as it establishes the lighting effect for the image. Line and value is the intellectual statement of an image, while color is the emotional. So for the feels I lay in some basic colors (in Photoshop) as my target for the final image. After arriving at a color comp I am happy with I do studies to really flesh out some of the key elements in the image. I am not very rigorous about how I do these. I just start grabbing whatever paper or cats are around to draw these on. In this case I wanted to try out a new Daler Rowney drawing paper with a few Caran D'ache Pabo pencils. Now that I've finished with all this over-wrought, preliminary procrastination, I finally begin the tight drawing. For this drawing I use lightweight bristol paper. For pencils I am using Prismacolor Turquoise pencils (an old favorite of mine) for the murky shadows, and a mechanical pencil for the detail-work. I use a small tablet light table to do the transfer. In Part 2, I will be covering the digital painting of the image. For colorizing this image I will be doing something a little different than I usually do. First, I will be using more opaque layers and Photoshop's blender brushes. Also, instead of working from a neutral mid-tone towards a fully saturated image, I am going to be starting with a dark and highly saturated base and painting in grays and complimentary colors to slowly work the image towards the color comp. It's a bold move. Tune in next time to see how it plays out. We are headed to GenCon in Indianapolis for their 50th anniversary show! It should be a super fun event, so if you are in the area be sure to drop by to say hello! Here is a preview of some of the brand new original paintings and drawings we will be bringing to the show. In a recent post I was asked if I'd go into more detail about how I apply and saturate color when I work digitally. Today, I'll be giving a brief overview of this. #1 The Pernicious Photo-tint Look. (Think: old colozied photographs) We don't want this. #2 The Vile Plastic Over-painted Look. (Think: purple wolf baying the moon airbrushed onto the side of a mobile home) We don't want this either. The first pitfall suffers from too much information from the original image, while the second suffers from not enough. We want somewhere in between. And thankfully, Photoshop has been built specifically for this. All we have to do is use the right combination of tools within it. To apply color in Photoshop I begin by making a new layer and then selecting a mode for it. In the example below of Little Red "Gonna-Ruin-Your-Day" Riding Hood, I have applied a flat red color to a selected area of her cloak. As I change the layer mode we see how the effect dramatically changes. A surfaces true color is only revealed in the area between the direct light and the shadow. For this reason, we are only used to seeing "true" red in limited areas. When we see an object painted in a single shade of red, it looks wrong and somehow flattened. This is because where the object receives direct light, the red will take on the color cast of that light, and where it is in shadow, it will take on the color cast of the environment's ambient light. Furthermore as objects recede from the viewer the color is further altered by atmospheric perspective. Certain layer modes saturate more heavily than others. Some darken as they saturate, others lighten. OKAY JUSTIN, THIS IS STUPID AND YOU'RE STUPID. WHY NOT JUST PAINT WITH NORMAL LAYERS? Normal layers are great! If you are just getting started, you should work with just these until you feel you understand them. They behave the most predictably and are extremely versatile if you are using brushes with low flow or opacity. However, if you are adding digital layers over top of a traditionally painted image you will find that eventually you obliterate portions of your original, and the that the final effect is plastic and uneven. (Pitfall #2) To truly take advantage of Photoshop's power, you need to use transparent layer modes. Photoshop has a dizzying array of options for colorization. What is important is finding what works for you. There is no real right or wrong. It is just whatever you can use to get what's in your head onto the screen. For me, the majority of my transparent layers are made up of Multiply, Color, Soft Light and Screen. You can do essentially anything with just these four and end up with a solid image. Multiply Layers tend to darken and add chroma in a very dull application. This is great for slowly building up colors and adding texture and tone to your image. It is very much like working with traditional watercolor. Great for building shadows and toning your image. Screen layers are essentially the opposite of multiply, these also add color slowly, but they lighten instead of darken. I use these to add direct lighting over the dark layers below. By picking a warm yellow color here I am able to slowly work up a nice natural looking lighting effect to my figure. Soft Light Layers are bonkers. They have no master, and obey no man. The math that governs them is not fully known to science. What I do know is that when a bright color is used on a soft light layer, it will allow for a very bright saturation of color which does not affect the details beneath it. For instance, I used a bright green color on a soft light layer to really pop the bright greens out from the rest of the image. Color Dodge Layers scorch out highlights. They are extremely brutal and should be used VERY sparingly. Too much and you are lighting your birthday cake candles with a flamethrower. But when used sparingly, they can help to intensify your brightly lit areas as well as any glints of detail light. I use Color Dodge layers to sharpen highlight areas, add rimlights, and sharpen object profiles against their backgrounds. When alternated with multiply layers it will help push the value range of the image. Color Layers. Not shown here because I use them so sparingly, but I do use basic color layers to push and pull color in limited areas. The Color layer mode is the classic means of photo-tinting, (and I need not badger you any further with warnings there). Just know that you shouldn't overuse them, but that in limited doses they are excellent. For instance, killing chroma: If an area is too red, I can select a blue color and lightly apply it on a Color Layer and it will pull the red back into check. Normal Layers. Finally, there is just no escaping at least some opaque work for me when I work like this. But now that we have already established our value range and our colors are fully laid out, we can add details and opaque work that blends rather seamlessly with the rest of our image. I also use it very transparently and often set the layer opacity to less than 50%. This general sequence offers me solutions to the problems I generally face as I work through an image. Everyone's artistic temperament is a little different, so play around with the different modes in different sequences and see what works best for you. I hope this was helpful! As always, I take post requests, so if there is something you'd like me to cover please let me know in the comments! Disney and Gallery Nucleus are collaborating on a "Beauty and the Beast" inspired art show in anticipation of the new film. We are very excited to be participating in such a monumental event!